Thank you very much Robo! See comments for details. I don't have my own printer, yet, so I'm not able to test this model myself. Feel free to modify anything so we can have a printable, working cube. 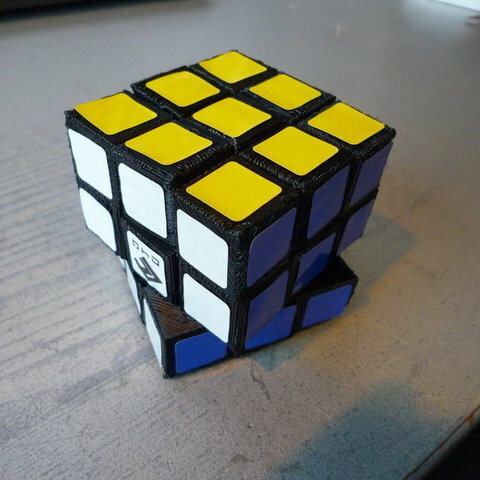 When the cube is functioning mechanically, perhaps we can distinguish between the sides without colors? See corner_color for an example. 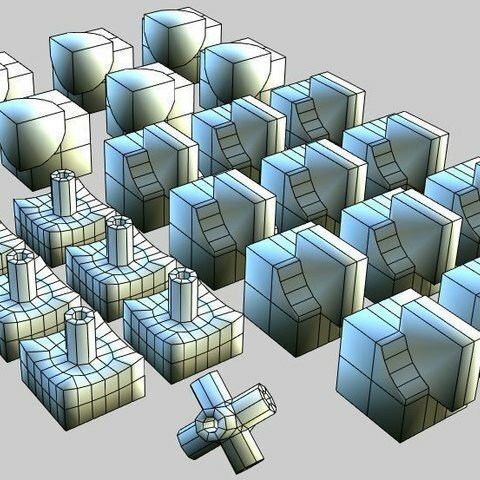 My 3D background is from image and animation rendering, where it's important to maintain quads and avoid many edges meeting in a vertex. I don't know if it matters much in 3D printing? The flat sides on the pieces are 20 Wings unit wide/high/deep, which should equal to 20mm. EDIT: I split the side and the corner (diagonally) in two parts to make it printable, but it needs to be glued together afterwards. Files updated. EDIT2: "v2" New side and corners, resting on side. Scaled 10x from before. EDIT3: "v3" Side piece turned the right way this time. Raft and flat bottom version of axis. All new objects combined in one Wings3D file for less clutter. EDIT4: April 17. 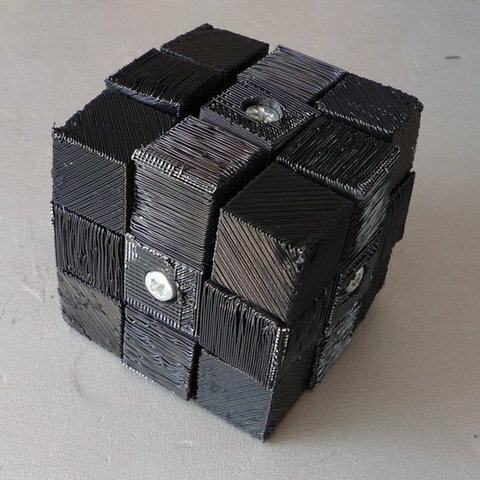 2010 - Robo printed the first working cube! EDIT5: "v4" Updated the corner piece with smaller connection part and beveled edges/smoothing (polygons went from 67 to 3432). Would love feedback and thoughts on this. Modeled in Wings3D http://www.wings3d.com original sources files included. cube_WIP.wings features a assembled cube for test fitting the pieces. The challenge is to deal with overhangs, find a good solution for the screws and springs and of course make it rotate well. I've made individual files for every part, some cleanup, smoothing and drilling is probably required. 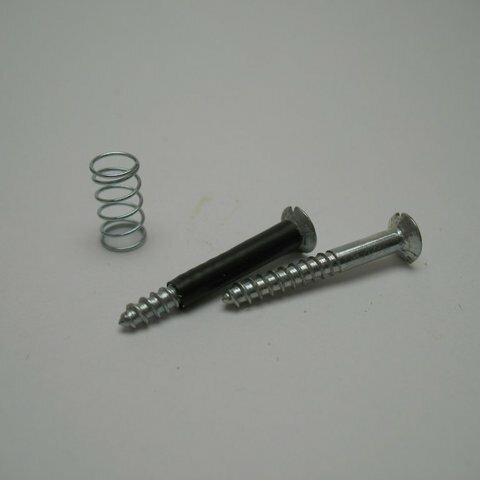 The screws needs to have threads only in the part which screws into the axis, so the center pieces can rotate freely. Perhaps it's possible to file off the upper threads one some screw? 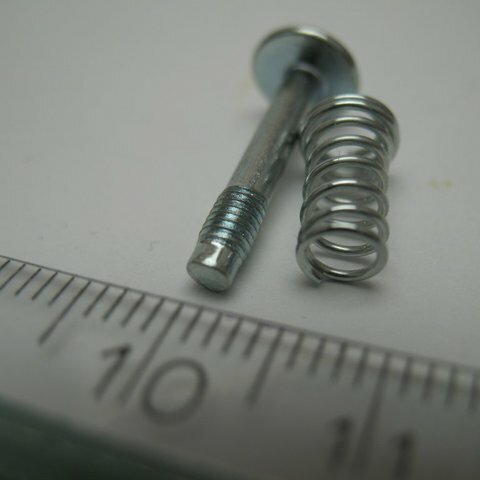 Springs is not critical for the basic mechanical function. See the attached picture for original screw, as well as an idea that might work without filing. You need the following number of parts.